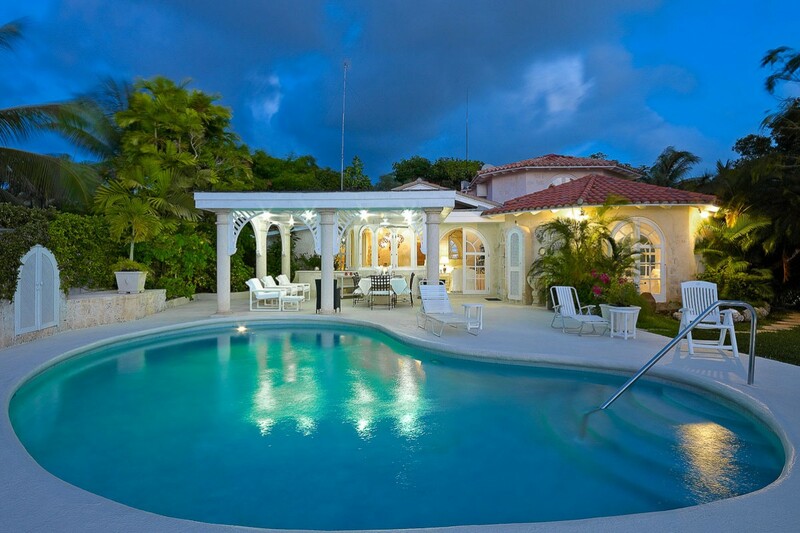 Villa Whitegates Barbados. 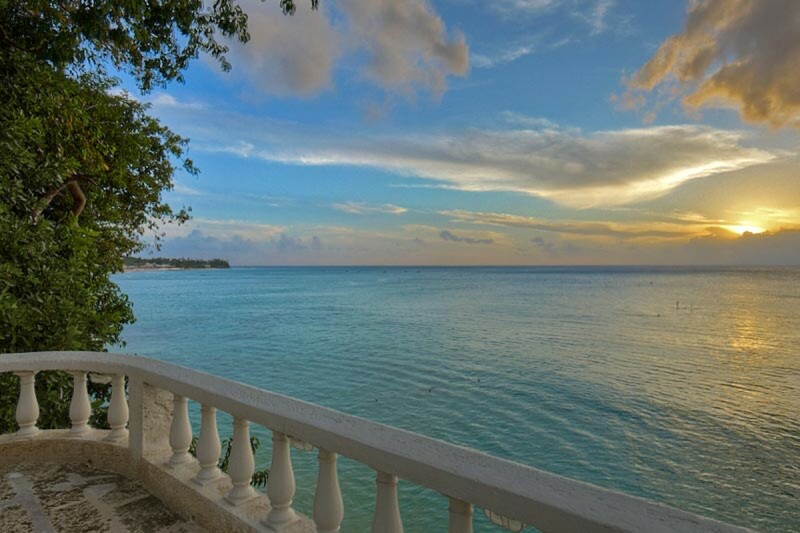 Any property that is in The Garden area of Barbados, and tucked along the edge of the sea is likely to be impressive and beautiful. 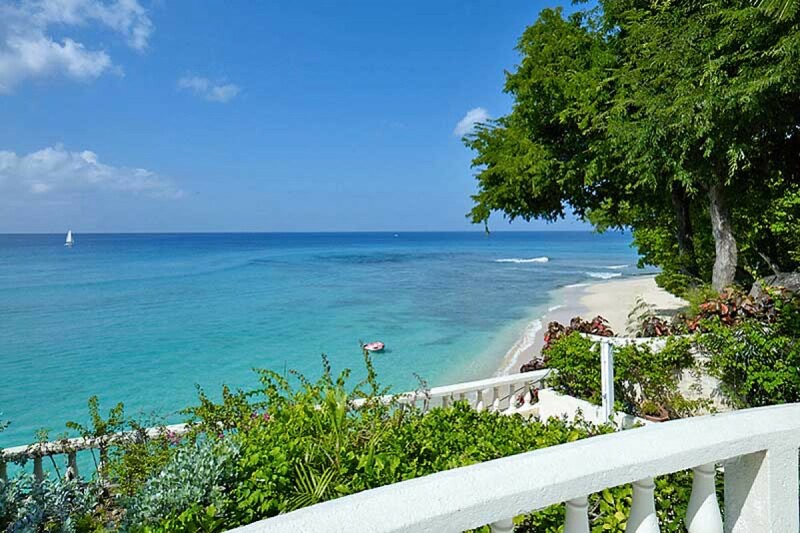 This is true of the gorgeous Villa Whitegates that is on a slight rise above the sea and offering unprecedented Caribbean views. 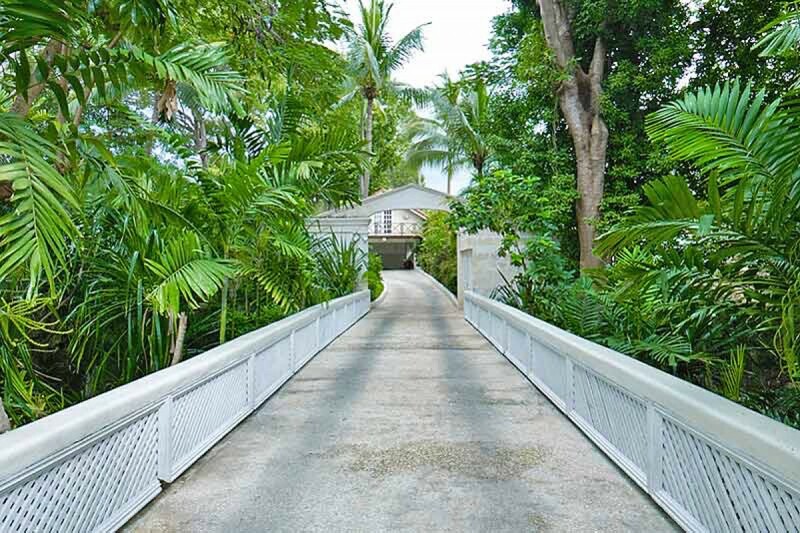 With private access to the sugary sands below, it is an estate-like property that is sure to delight. A west coast setting ensures that you get excellent sunsets at the end of each day, and you can always savor them from the Beach, or you can enjoy the sight from the superior comfort of your private pool terrace. A kidney-shaped pool, it is framed by the lovely gardens and grounds and looks out over the sea view. 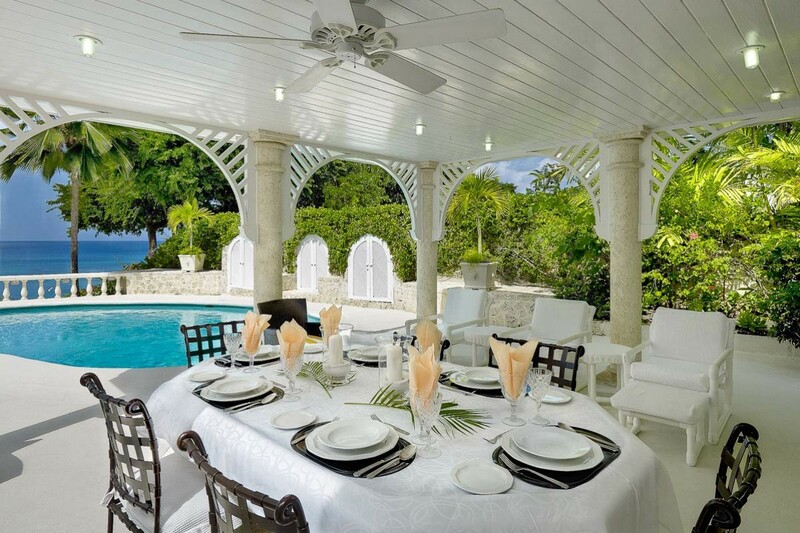 Along one edge, a stylish gazebo houses al fresco dining and lounging, and this leads you inside the delightfully colorful villa. 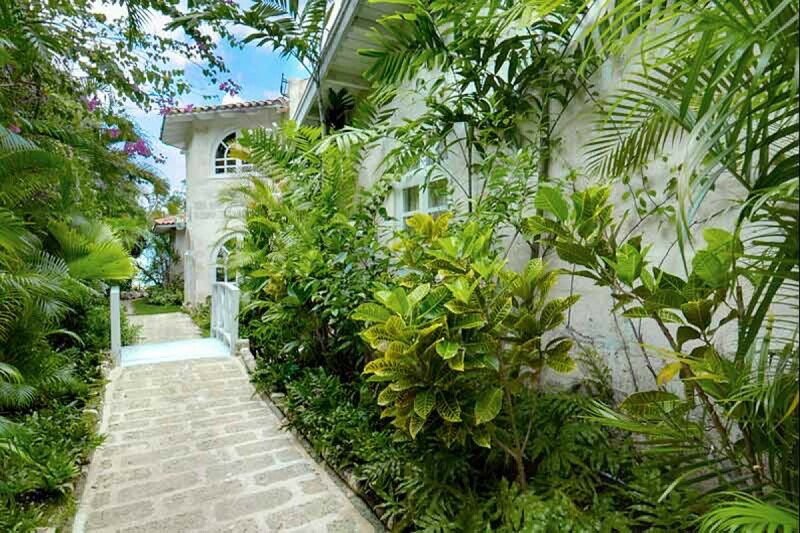 Surrounded by gardens, it maintains an outdoor feel from every interior space. The great room off the terrace offers high, pickled wood ceilings and cool terrazzo floors. It features an enormous banquette sofa and oversized chairs all upholstered in airy champagne textiles. 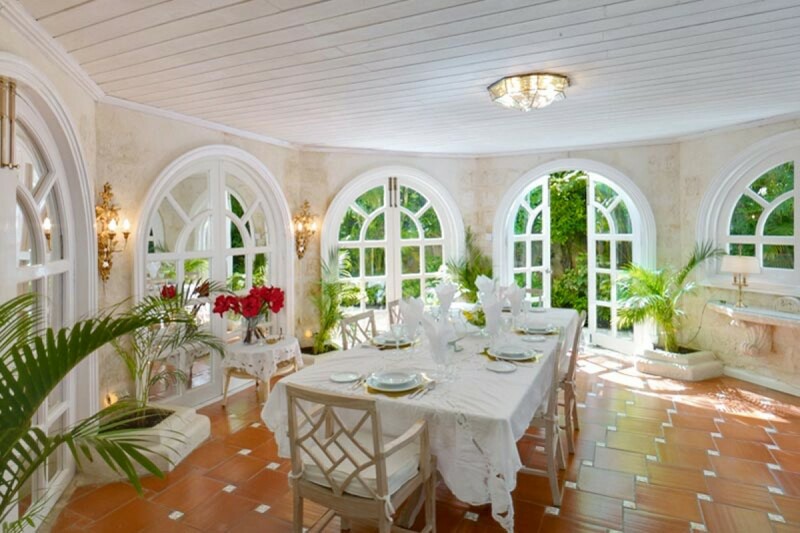 The dining room features arched, French doors to the gardens, and is housed in a turret-like structure at one end of the villa. 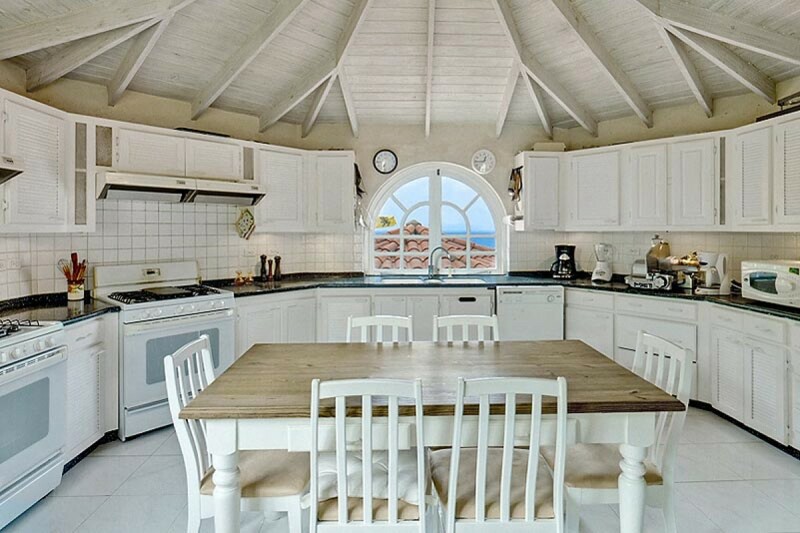 The kitchen is above and is a professional-quality space that will be put to use each day by your private chef. 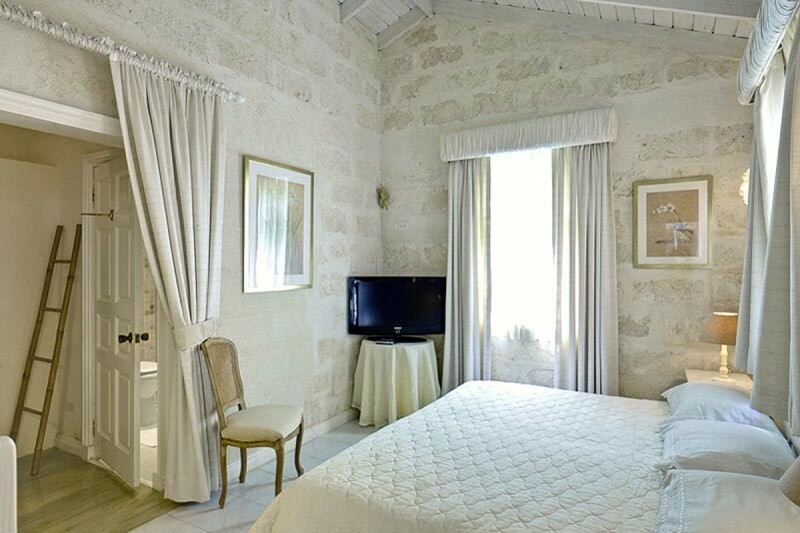 The villa is staffed by the cook, housekeeper and laundress, and that leaves only the relaxing up to you! 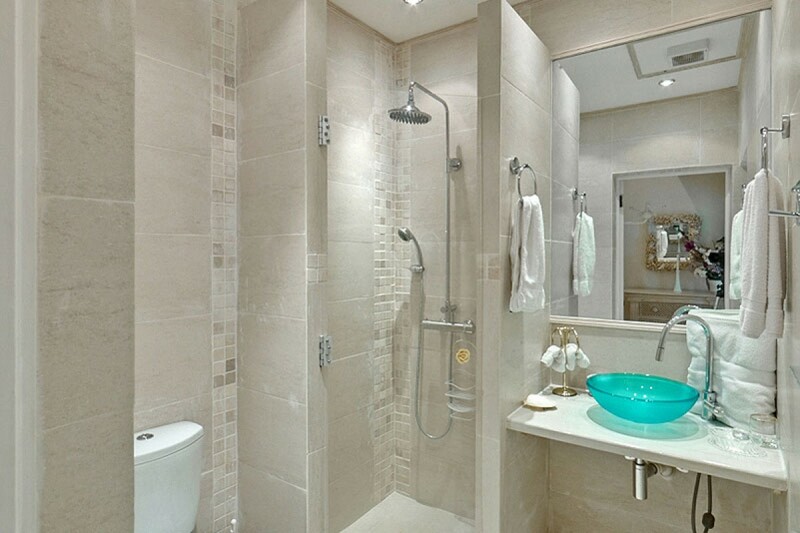 You can do this in the many outdoor and indoor spaces, but especially the four impressive bedrooms. 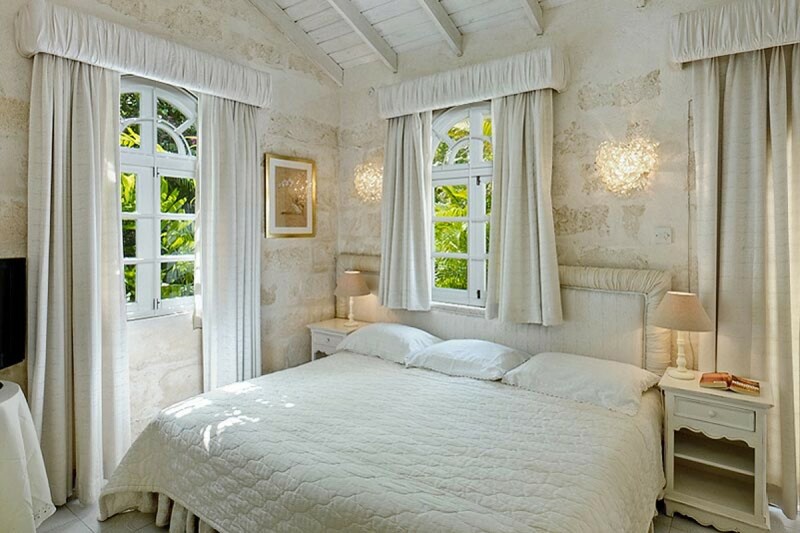 Each is a stunning retreat with large and private bath, garden or sea views and luxurious décor. 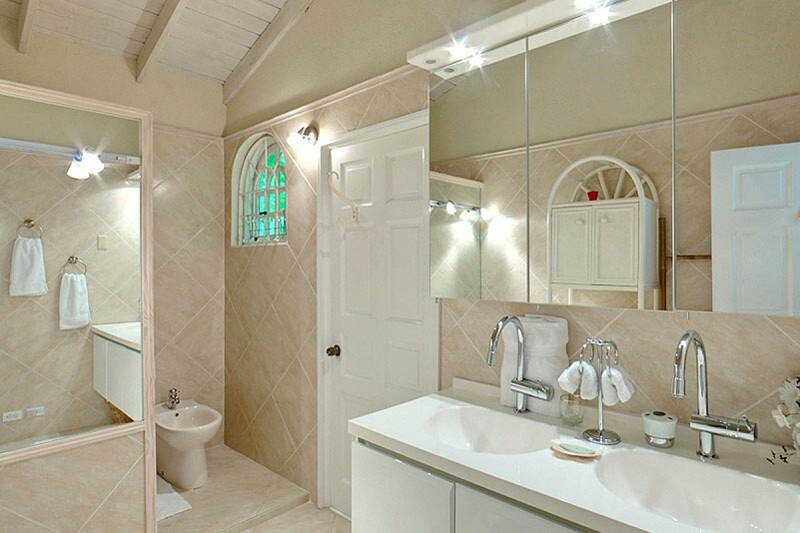 Each is ensuite and offers optimal privacy. 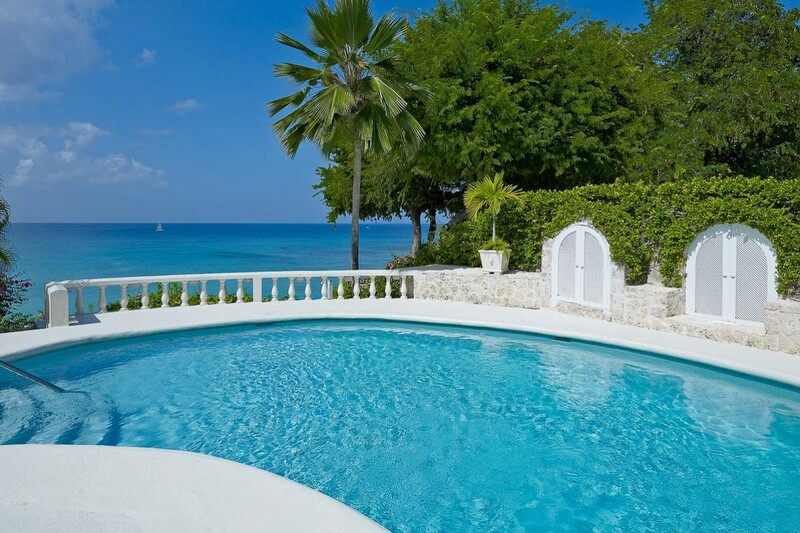 The Villa Whitegates is an estate-like property with a full staff and one of the more stunning locations along the west coast of the island. 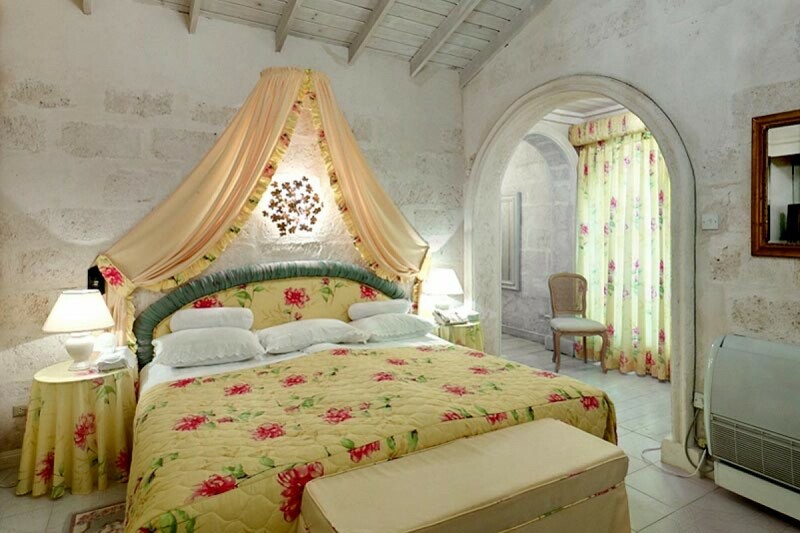 Bedroom 1: Master bedroom with a king-size bed, A/C, dressing room and en-suite bathroom with shower, vanity and wc. 2 guests maximum. Bedroom 2: Bedroom with a king-size bed (can be converted to two single beds), A/C, dressing room and en-suite bathroom with shower, vanity and wc. 2 guests maximum. Bedroom 3: Bedroom with a king-size bed (can be converted to two single beds), A/C and en-suite bathroom with shower, vanity and wc. 2 guests maximum. 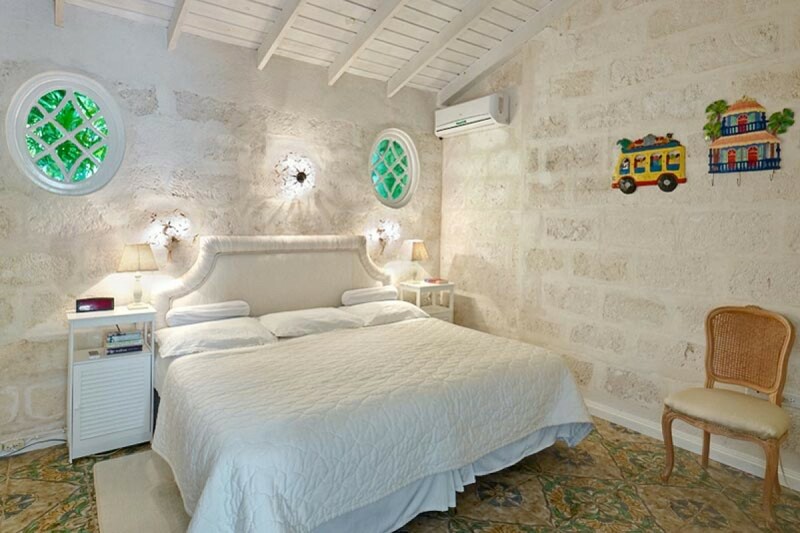 Bedroom 4: Bedroom with two single beds, A/C and en-suite bathroom with shower, vanity and wc. 2 guests maximum. 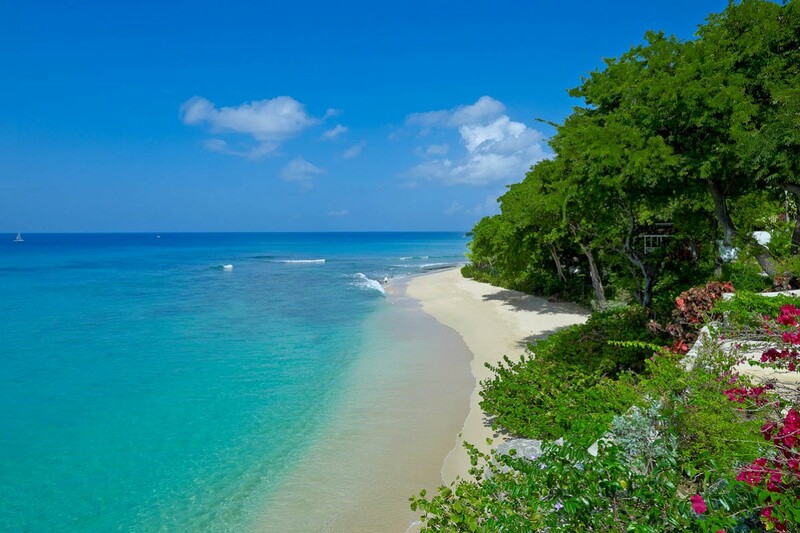 We have just returned from 2 weeks in Barbados. We stayed at this lovely villa for one of the weeks. We had our own private pool and even though all the beaches in Barbados are technically public beaches, we felt like we had our own private beach too. The terrace, pool area and location of this villa are without a doubt the best features of the villa. It was so lovely that we didn't' leave that often. We had most of our meals outside. When we did want to leave, Holetown was much closer then we expected. Just a couple of minutes away by car. "Thank you for your help with the process. 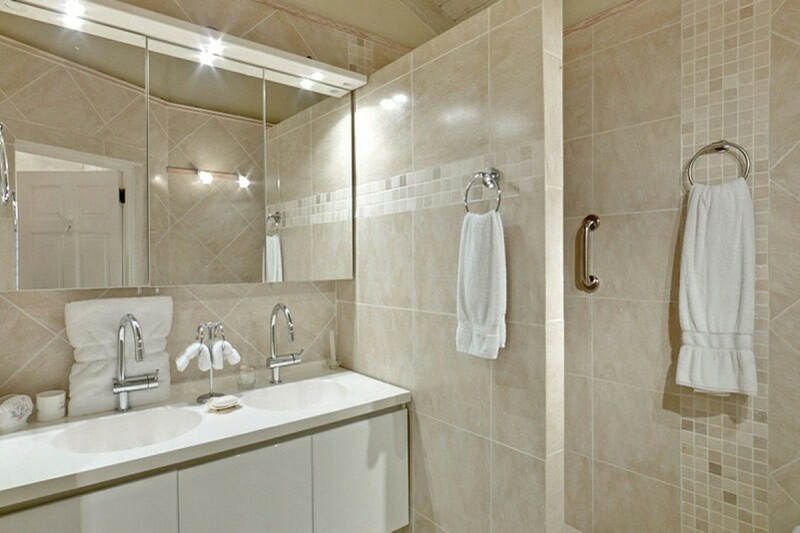 The service you offered was great - better than any other Villa Specialist I've dealt with."